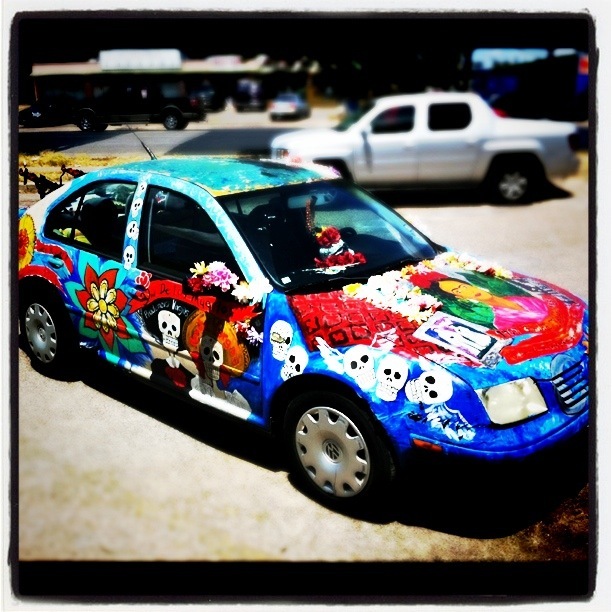 Local artist Franziska Gonzalez drives an art car and I had the privilege to speak with her this afternoon about her influences, her family and her really cool car. A third generation American with a family deeply rooted in tradition, her passion of painting manifests itself in the form of traditional Day of the Dead imagery, Frida Kahlo and the love of her family. The tradition of the Day of the Dead is a huge influence for her, as she has skeletons with the names of her grandparents, Prudencio and Rosita, on one side of her art car, “it is a way of keeping them with me,” Gonzalez says. I love this. I have some pics of another weird austin car. What a great idea for a post.